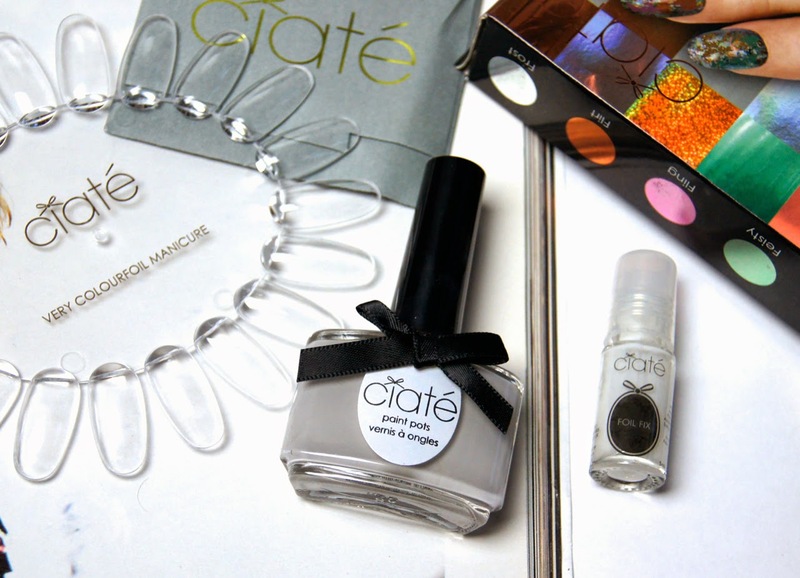 Ciate are the brand to turn to when you're looking for a statement, nail look. Their innovative, nail-design kits allow you to create something a bit more interesting and unusual, without needing to have the patience of a saint when fiddling around with tricky tools. 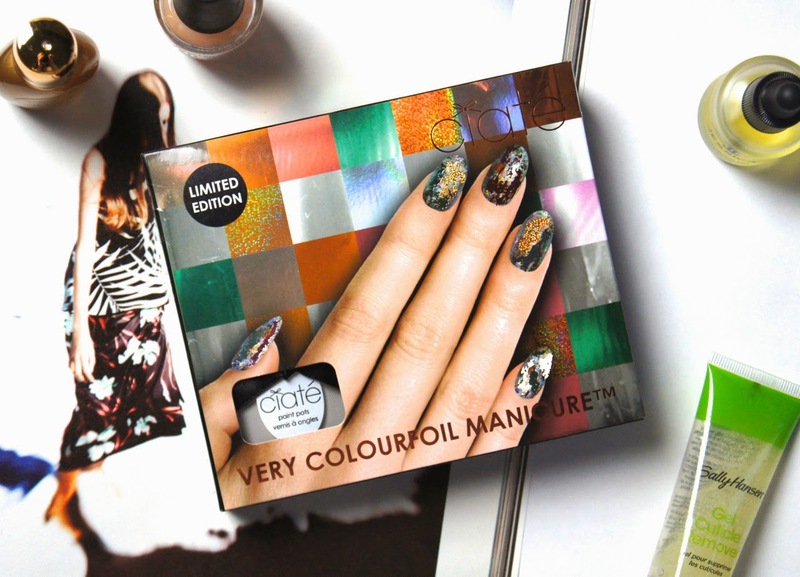 On holiday in Dubai, I picked up the Ciate Very Colourfoil Manicure and I've been loving the cool, edgy look it creates. This foil, manicure set is limited-edition and I purchased mine a couple of months ago, so if you want it, you've got to move fast! Luckily, it's currently on offer for an amazing half-price at Sephora, if you're interested. The Very Colourfoil Manicure comes in three colourways, all offering a different, base polish and alternative foils. Within the set I chose, Wonderland, you're given a full-size Cream Soda Paint Pot, which is a soft, subtle, grey shade. Along with that, you get a small bottle of foil-fix adhesive, a selection of foil, a nail art wheel and some instructions. 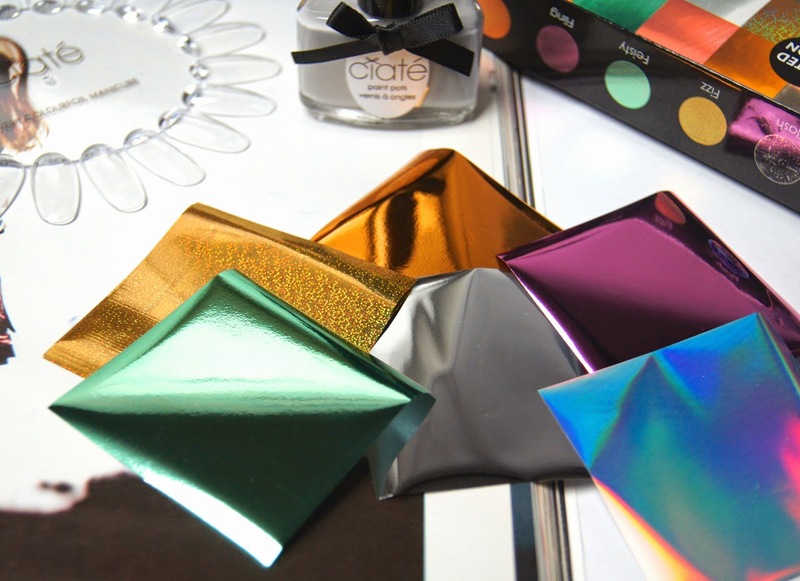 Wonderland contains six, different foils: Flash, a silver holographic; Fizz, a gold holographic; Feisty, a muted mint green; Fling, a bubblegum pink; Flirt, an orange copper and Frost, a straight-up silver. Compared to the other sets in the range, the colours in this one aren't as clashing and have more of a pastel feel to them, which is much more my style. Although it looks like the application process would be time consuming and fiddly, the foil manicure is actually so quick and easy. You simply paint your nails with the base colour included in the set (or any other polish shade you'd like, for that matter) to achieve a solid, background colour. Then, you brush on the foil-fix wherever you want to stick the foil and wait for it to dry a little. Once the milky-white liquid has turned clear and has become tacky, you place a sheet of foil over the nail (shiny side up!) and press down to make sure it's fully adhered. 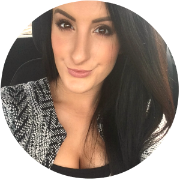 Simply pull it off in a quick motion, much like waxing your legs, and the colour should be left behind. If not, you may need to wait longer for the 'glue' to become sticky enough. All that's left to do is finish off with a slick of a top coat and you're good to go! You have lots of options to customize your look, from covering the entire nail in just one foil or adding patches of colour to create a distressed look to layering the foils, mixing and matching the colours to your taste. Personally, I like to stick with using one foil at a time, like I've shown in the swatches below. Surprisingly, the foil is so thin that it sits totally flat on the nail, even when layered, with no uneven lumps or bumps to ruin the finish of the manicure. 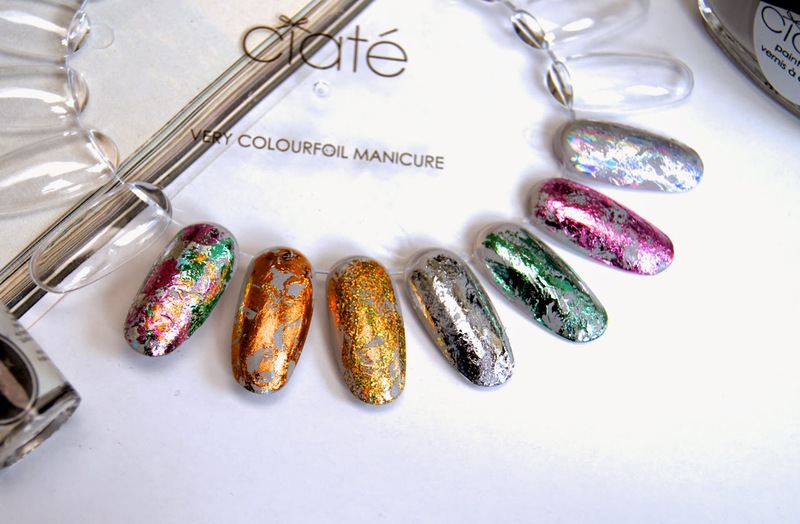 Unlike with other Ciate sets, such as the Caviar Manicure which lasts maybe one day before it starts chipping off, once the foil has been sealed in place with a top coat, the nails stay looking flawless for roughly a week. For one, full manicure, I'd say I use three quarters of a sheet of foil. Obviously, if you mix the colours, then you'll use less of each shade. As you get five sheets of each colour, this set should give you twenty-five applications, at least. Although £18 is a lot to spend on one, nail purchase, my talons have received a lot of compliments and attention when I've used this kit and I've barely made a dent in the foil, despite getting a lot of use out of it! Do you like to play around with creative nail designs, or do you prefer to stick to simple, one-colour manicures? Oh I don't think I'd ever be able to do something like this, I can't even paint my nails normally! Looks amazing! Fingers crossed I'm not too late to pick one up!